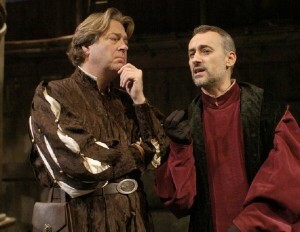 Roger Allam’s sad-eyed Leonardo by extension is at his best not silencing the so-called “truth-teller” who shadows his actions but when meditating on beauty – a realm, he argues, that is “never finished” and that exists cruelly to acquaint artists with the dual experiences of creative success and also failure. 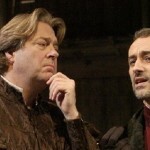 For it is in the performances of Roger Allam as the detached, vain and pensive Da Vinci and John Light as the pious and agitated Michelangelo that the production reveals its high points. There are several strands to Gregory Doran’s compelling production. John Light’s obsessive, dust-coated Michelangelo is a bearded solitary with a gruff exterior, while Roger Allam’s silky, seen-it-all Leonardo is a political operator as well as the visionary inventor with dreams of flying.